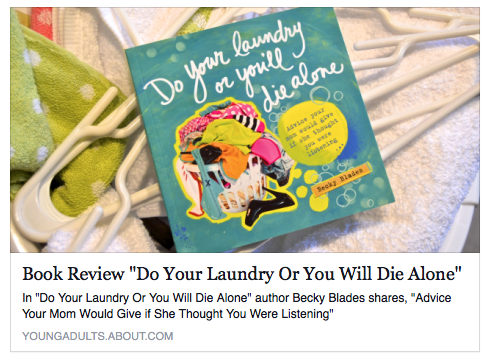 About.com picked Do Your Laundry or You’ll Die Alone as one of its TOP 5 PICKS IN PARENTING! The “everything-you-need-to-know-about-anything” web publisher is one of the most visited sites in the U.S., so we are thrilled that its experts see the value of our freshly folded motherly advice. About.com Young Adults expert, Lisa Heffernan writes: “In her beautiful volume Blades shares the thoughts so many moms of teens and young adults would like to offer up to their high school and college kids. Instead of spending her daughter’s final year at home trying to inundate her with any missed lessons, Blades took out her pen and kept a running list of what she wanted to share with her daughter. After her daughter moved into her college dorm, she emailed the carefully crafted list brimming with love and humor.